Join us to support the Bearings Bike Shop! Experience Monday Night Brewing’s new space + free tastings and FOOD! Hear about Bearings growth, and take a peek at (or a ride on) the new Atlanta BeltLine Westside Trail! *A very limited number of tickets will be available on site, so be sure to get yours early! Bearings Bike Shop is a youth development organization where kids in Atlanta can earn and maintain a bicycle while developing the skills and character essential to success in adulthood. Kids have fun, share community, and work through challenges. As they build bikes, they have the opportunity to earn one of their own and experience the freedom and joy only a bike can provide. This Saturday, Sept 12 we will be at Root City Market. It's an opportunity to shop from local makers- the best of the south! Hosted at Stove Works (112 Krog St, Atlanta), right off the BeltLine and across the street from Krog Street Market. You can come see us at the market and then stay for the BeltLine Lantern Parade that evening. Did you know our best deals are in person at markets?! We will have sales on art print combos, stationery, and linens. Mark your calendar and secure a ticket... We are offering a pop-up brunch August 15 & 16 at The Preserving Place in Westside Provisions. This locally sourced, five course brunch is sure to please. We will also be having our good friend (and coffee guru), Andrew Beatton, serving up fresh pour overs. And yes, there will be a seasonal cocktail to sip on too. Be sure to shop the Westside Farmers Market after the Sunday brunch! Online tickets are available in The Preserving Place shop. 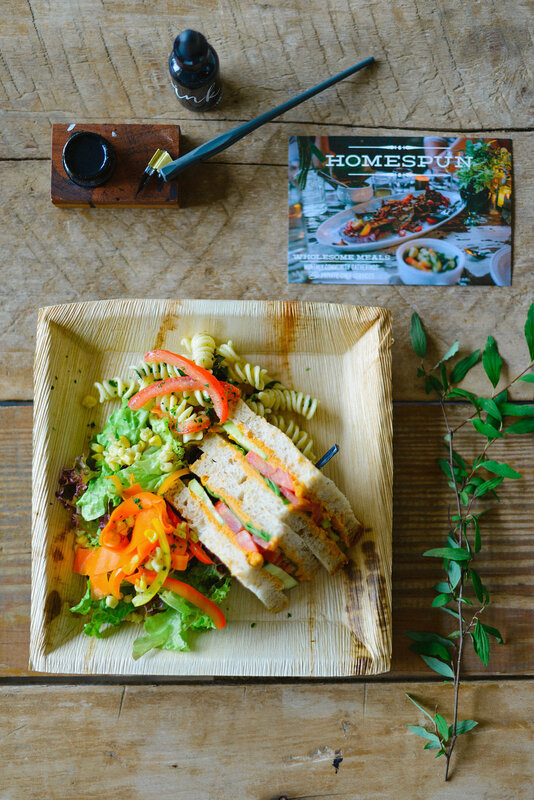 You will be able to purchase Homespun ATL goods once the store opens later this month. The selection includes a variety of our gathering-inspired stationery & the popular Georgia Peach art print. It's no secret we love collaborating and supporting local Atlanta businesses and entrepreneurs. The opportunity to provide a meal for a workshop or retreat is always a special treat. 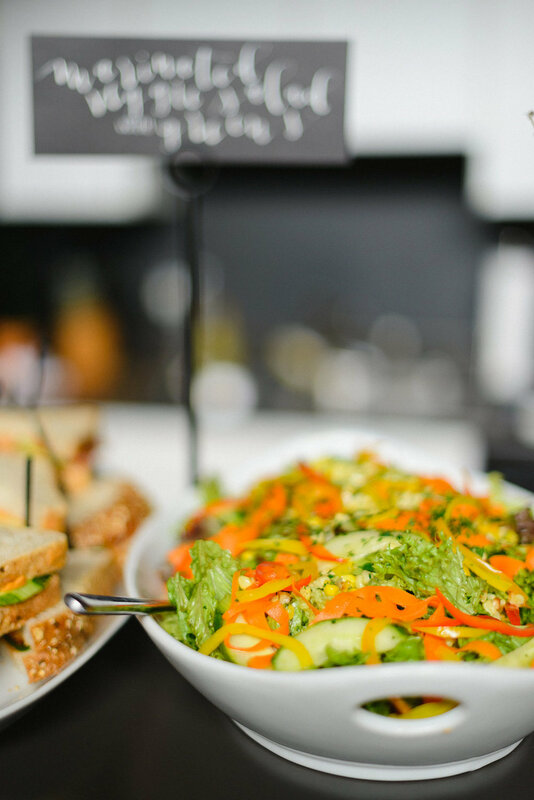 At one of Erica Loesing's calligraphy workshops Chef Jason served up a fresh lunch spread. You can find more behinds the scenes photos and details as the class was featured on Style Me Pretty. Last minute shopping? We have goods that will make any hostess or foodie smile. Order by 11:59 PM EST on December 17 and select the priority shipping options for Christmas delivery! Plus, we are having a HUGE flash sale... I mean huge! Click on over to Instagram or Facebook for details and coupon code. We are so proud of our friend, Phil Sanders. He's the visionary and face behind Foster, which is an expansive 2,000 square foot working space located in downtown Atlanta by Ponce City Market. They operate as a members-only workspace with daily passes and workshops available. "Foster exists to build a culture of balance, freedom, & growth amongst Atlanta's creative citizens. We believe in close-knit community. We thrive in spaces where thoughtful collaboration exists in the everyday. We are invested in our city & want to see it flourish." Foster is in the midst of a campaign to raise funds to build out and outfit the space. We would encourage you to get involved, and support this community. Annnd...they have amazing perks for donating (ie: Andover Trask Tote, Atlanta on the Rise Flag, Discounted Space Rental, etc). We are planning on offering cooking workshops (come the new year) in their beautiful terrace event space...more details to come. Please consider investing in the campaign...or if you're a local creative and in need of a workspace, apply for membership. This weekend Jason will be part in the Junior League of Atlanta Tour of Kitchens. On Saturday afternoon we will be doing a demo in the beautiful kitchen (photo above) designed by CSI Kitchen & Bath. Jason will be preparing Ricotta Gnocchi with fresh market vegetables. Did I mention that you get samples?! The Junior League of Atlanta, Inc. Tour of Kitchens, entering its 17th year, features a view into 14 of Atlanta’s finest residential kitchens. The two-day event has raised more than one million dollars since its beginning to aid the Junior League of Atlanta, with a membership of nearly 4,000, to carry out its mission towards community initiatives benefiting women and children at risk. Tickets are $35 online ($40 at the door) for a sneak peek into 14 of Atlanta’s most spectacular kitchens (7 each day) created by Atlanta's top designers. The JLA Tour of Kitchens features a view into 14 of Atlanta’s finest residential kitchens.